Have you refrained from correcting your crooked teeth because you don’t want to endure years of wearing braces? Traditional braces deliver great results, but many adults don’t want to commit to two or three years with a mouth of metal. Fortunately, there are now better braces — FASTBRACES® utilize advanced technology to perfect your teeth faster, for the same great results as traditional braces in as little as six months. Considering perfecting your smile with fast braces, so you can always grin with confidence. FASTBRACES® are the latest innovation in orthodontia. They are a fixed brace treatment that improves upon the concept of traditional braces for faster results. FASTBRACES® straighten teeth like traditional braces, but because they work differently, this innovative treatment can deliver results in one-fourth the time of traditional braces. To understand the innovation of FASTBRACES®, you have to understand how traditional braces work: Braces typically move the tops, or crowns, of your teeth during the first year you wear them, and in the second year, the braces work to move your tooth roots. Traditional braces take so long to work because the process is broken into these two parts, moving each part of the tooth separately at a different time. 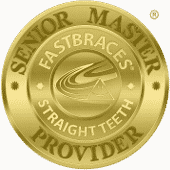 FASTBRACES® are advanced to speed the process because they use a special bracket and single wire to move both the crown and root simultaneously. Faster results: Why wear braces longer than you have to? With FASTBRACES®, you get the same results in far less time than traditional braces. Less discomfort: Patients report less dental pain with FASTBRACES® than with traditional braces, so not only do FASTBRACES® work faster but they’re more comfortable, too. Less noticeable: If you opt for clear brackets with the single wire of FASTBRACES®, your braces will be hard to detect.